You have been asked and kindly accepted to deliver the keynote lecture for the forthcoming 51st Biennial Meeting of German Historians in Hamburg this September. The theme of this Biennial Meeting is “Matters of Faith”. How does faith figure in your approach towards historical research? There are various ways of thinking about “faith”, but the most useful is to use it to avoid that thorny word “religion” (in the aftermath of Wilfred Cantwell Smith, and to an extent Talal Asad). As someone who was trained as an economic historian, I was obviously inclined at first to avoid such questions, as they seemed to be outside the limits of the “rational” which economists think of as their domain. However, even economic historians came eventually to address this set of issues in one way or another, largely through their engagement with Max Weber. I myself was brought to questions of faith through two sets of collaborations. One, with Velcheru Narayana Rao and David Shulman, made me engage with questions of faith in the context of South Indian courtly culture of the sixteenth-eighteenth centuries. This meant doing much more than, let’s say, treating temples as economic institutions, or faith itself as a strategy for legitimation. The other collaboration, with Muzaffar Alam, led me to think about both elite and popular Islam in India, especially in the Mughal period. I learnt an enormous amount from these three scholars, especially because both Narayana Rao and Muzaffar possessed a “traditional” style of knowledge as well as a modern one. And soon enough, I also became interested in Christianity, especially in relation to the Portuguese empire. So, eventually, I do think quite a lot about “faith” and faiths, and I have even written a fair amount about both methodological and empirical issues in this regard. The partner country of the 51st Biennial Meeting of German Historians will be India and thus for the first time a country from outside Europe and North America. Although a partner country can naturally only be a contemporary state, when it comes to the history of the pre-independence period, the term “India” has a different meaning: It denotes a cultural zone which is much larger than present-day India. For this reason, the use of the term “India” in studies on ancient, medieval, or early modern South Asia has been criticized. What would be your position on this issue? I think this is much ado about nothing, stemming perhaps from a certain hyper-sensitivity, which is the result of India’s current relations with its neighbors. Obviously, the space historically designated as “India” (“al-Hind” by the Arabs in the early centuries of Islam, then “Hindustan” in Persian, and also “India” by the early modern Europeans) is not the same as the modern nation-state of India in terms of its boundaries. In fact, the limits of “al-Hind” or “les Indes” were often contested anyway; in many usages they included parts of Southeast Asia. But we should be clear that even if the Cold War term “South Asia” is apparently more neutral, it also carries its own baggage. Also, other terms were used to designate regions over long periods of time, such as Bengal, Gujarat or Kashmir. When appropriate, those are also used by historians, and rightly so. But I would find it rather odd to take a term such as “Bangladesh”, and talk of it in the tenth century CE, when no one used it. That seems to me to step into an excess of nationalism. The choice of India as partner country signals the interest of the organizers in opening this forum more broadly to intercultural and transcultural perspectives. You were, inter alia, teaching “World History, circa 600 to 1760” during the last academic term at UCLA. What potential do you see in the concept of global history? “Global history” or “world history” plays two distinct roles for me. One is in the classroom with undergraduates, when it allows one to deal with a broad geographical sweep, while stepping around the traps of reifying both “nation-states” and “civilizations”. In the class you refer to in UCLA, I was able all at once to introduce students to Tang and Song China, the Indian Ocean world, and the trans-Saharan trade, as well as the commerce of the Hansa and the Italian Renaissance. This may seem superficial, but it is a good idea for them to get a “big picture” before taking a specialist seminar on Machiavelli and his reading of Roman authors, for example. On the other hand, “global history” is also a potential research field, which — like many fields — also has a large scope for abuse. Often, it consists of people writing large books, making tall claims, but in fact based on very little that can be considered real research or original thinking. I find this especially true in Europe, where the fashion for “global history” has led to a lot of superficial history and the making of meaningless “laundry lists”. For me, a global history that abandons primary materials is no history at all. The combination of the theme “Matters of Faith” and the partner country India does not seem to be merely coincidental. Although the focus on religious identities rather than other forms of identity has been often overemphasized for the history of the Indian Subcontinent, religious diversity makes this region particularly interesting for any analysis of “matters of faith”. Do you feel that the Indian context offers particular insights on religious diversity that might contribute to the study of related phenomena in other parts of the world? Whether or not one wants to call them “religions” is a thorny matter, which many people (like my late friend Friedhelm Hardy) have struggled with. Let us just say that historically, the subcontinent proves to be an interesting laboratory in terms of how faiths or belief-systems overlap, intersect, and so on, and how complex this process has been and continues to be. In turn, this meant that the political and institutional arrangements that were in place before 1800 also corresponded to this complexity. When you read a text by a Jesuit written in the Mughal court in 1600, you see how he has to grapple with this, when his points of reference are far more simplistic systems like Portugal or Italy. It is certainly my conviction that as the landscape of faiths in Europe evolves, and the old Westphalian model is eventually buried, a closer look at these other historical experiences could be useful. I don’t wish, by the way, to claim that matters of faith were never attended by violence in the precolonial subcontinent. But the lines of division, and the conceptual language, were really quite intricate. Periodization is a crucial issue in historical research. The use of the European model of “ancient ó medieval ó modern” in Asian history has been heavily criticized and also passionately defended. Where do you stand on this problem? Periodization particularly interests some historians, those who deal with relatively long stretches of time. I don’t doubt that it is perfectly possible to do research on the fourteenth century as such without taking a position on whether it is “medieval” or not. To the extent that periodization is a matter of organizational convenience, it seems self-defeating to expend too much energy on it — unless there is something really at stake. In the case of India, I do think there is something at stake when people call the eighteenth century the “medieval” period. When they do so, they intend implicitly, first of all, to argue that colonialism brought modernity, and second, to imply that a thousand years of stasis preceded British rule. These are lazy and annoying assumptions. But there is no reason why one cannot slice our periodization much finer. For example, as you know, the use of the term “late antiquity” in Europe by Peter Brown and others brought a wave of fresh thinking and conceptualization with it. So for me, these matters must be placed in two contexts: first, what purpose do these periods serve; and second, what are the concrete advantages of changing our periodization? In Europe there is often a rift between those scholars doing pre-modern Indian or South Asian history and those specializing in the modern period: for theoretical-methodological reasons, for the use of (inevitably) completely dissimilar sources, for the proficiency in different languages, and for other causes. As someone who has dedicated his research mainly to the so-called early modern period, a phase of transition in many respects, you have always been interested in earlier and later developments as well. What promise do you see in academic networks that go beyond established epochal boundaries in research as well as teaching? The matter of teaching is relatively easily addressed I believe, because this sort of division of labor helps to slice up courses and also permits the writing of collaborative text-books and so on (as with Hermann Kulke and Dietmar Rothermund). The hard question is research. This is because if you begin such conversations across the rifts, you can see how utterly arbitrary the methodological divisions are. On the one side, from the point of view of someone who works on Indian connections to Central Asia or China through the Dunhuang materials, how would you justify dealing with India’s foreign relations in the 1960s and 1970s without using the Soviet archives? And this is precisely why such conversations should occur, to shake people out of their complacency. In the reverse direction, it has often been the case that those who deal with “ancient” materials are far more attached to an older style of philology, and resist reading in the social sciences. This is a divide I have seen in an institution such as the Collège de France, which has all these conflicting traditions under the same roof. I believe that the great impact of the work of someone like D. D. Kosambi or Sheldon Pollock — whether one agrees with them 100 percent or not — is because they were able to straddle this divide. But again the challenge is the same in a way as in “global history”, not to become the jack-of-all-trades who is the master of none. Das Interview führte Annette Schmiedchen. 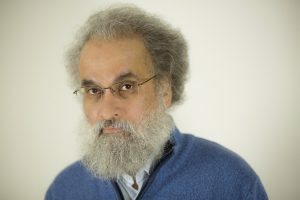 Sanjay Subrahmanyam promovierte (Ph. D.) 1987 an der Delhi School of Economics zu dem Thema »Trade and the Regional Economy of South India, c. 1550 – 1650«. Nach Forschungs- und Lehrtätigkeiten in Paris und Oxford wechselte er 2004 an die University of Califormia, Los Angeles (UCLA), wo er seit 2014 Inhaber des Irving and Jean Stone Endowed Chairs in Social Sciences ist. 2000/2001 war Sanjay Subrahmanyam Fellow am Wissenschaftskolleg in Berlin. In diesem Jahr wird er den Gastvortrag auf dem 51. Deutschen Historikertag in Hamburg halten. Annette Schmiedchen habilitierte sich 2009 an der Universität Halle im Fach Indologie. Seit 2012 arbeitet sie am ERC-Projekt »FoundMed – Foundations of Medieval Societies« mit.